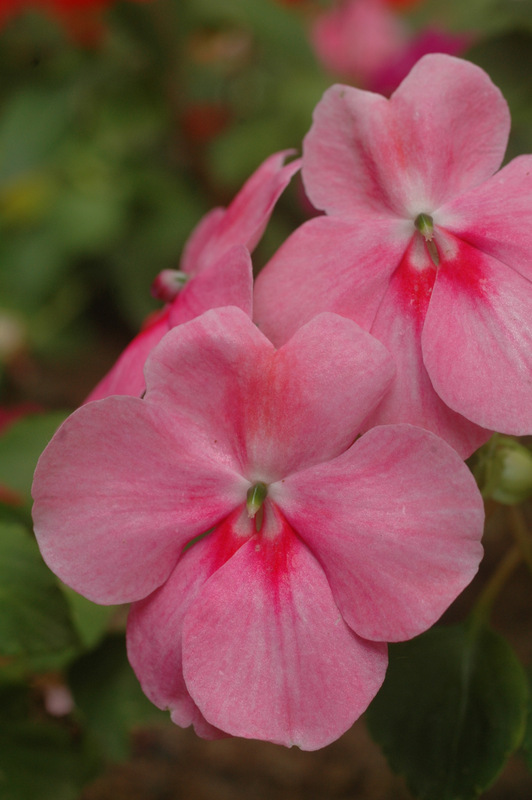 Impatiens – known to many as “Busy Lizzies” – are a vital ingredient to any summer garden. Few other plants offer such a mass of blooms for such a long period as these valiant little plants. There are lovely rich hues of reds and oranges for “hot” beds, gentle pastels to relax the eye and a pure white hybrid to add a sense of coolness on those hot summer’s days. Couple them with Dahlias and your garden will simply be bursting with colour! In fact, the kaleidoscope of colours at your disposal will quite possibly leave you with a dilemma around choosing what you’re going to buy. Impatiens will perform beautifully all summer long, impressing all passers-by. Once established, discerning gardeners the world have found them among the most carefree annuals in the garden. Impatiens prefer growing in a lightly or partially shaded position, but they will tolerate periods of full sun during the day – they do very well in morning sun positions. Impatiens can be used extensively around patios and pool areas, along driveways and at entrances, in shady beds under trees or in borders shaded by wall, in-between shrubs and groundcovers. Window boxes, containers and the ever-popular hanging baskets also make for excellent homes. Like all seedlings, regular watering during the first two to three weeks is necessary. After the plants have established themselves, it is better to water thoroughly, less frequently. Remember that when it rains, plants under trees do not always get the benefit of the water because the trees act like an umbrella. Impatiens grown in sunnier positions will need more frequent watering. Impatiens are “carefree” plants and deadheading is not necessary (i.e. removing spent blooms). Occasionally, in heavy shade or where the plants have been over-watered or overfed they can become leggy. Pinching back will encourage branching, a better bush shape and more flowers. Dahlias should be planted in a sunny location (minimum six hours of sun) that is protected from wind. They like fertile, well-draining soil. Before planting, prepare the soil by adding compost or well-aged manure. 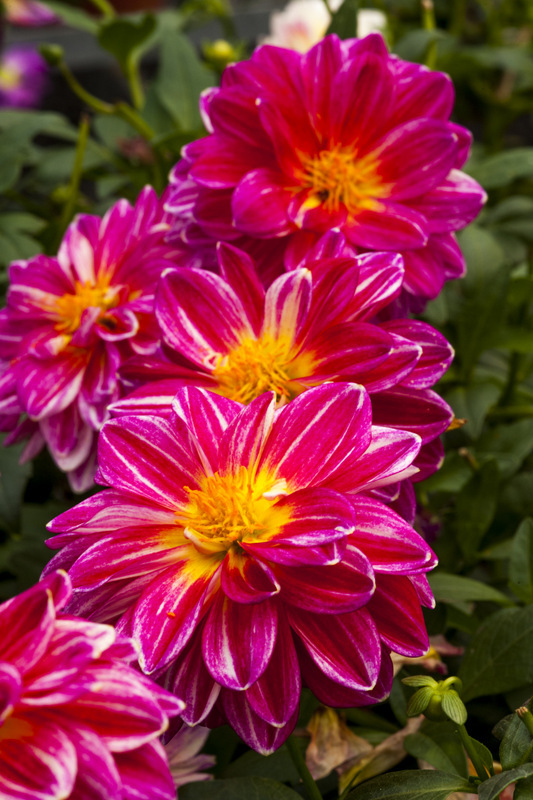 Despite Dahlias requiring regular watering, it is very important that their roots do not sit in water logged soil. Once planted, allow the plant to establish and when it displays three or four pairs of leaves, pinch the terminal shoot. This will encourage side branching which will produce a bushier, sturdier plant which in turn means more blooms. This plant benefits from regular, fortnightly feeding especially whilst flowering. Removing the old and dying blooms allows for more energy towards the production of new flowers. 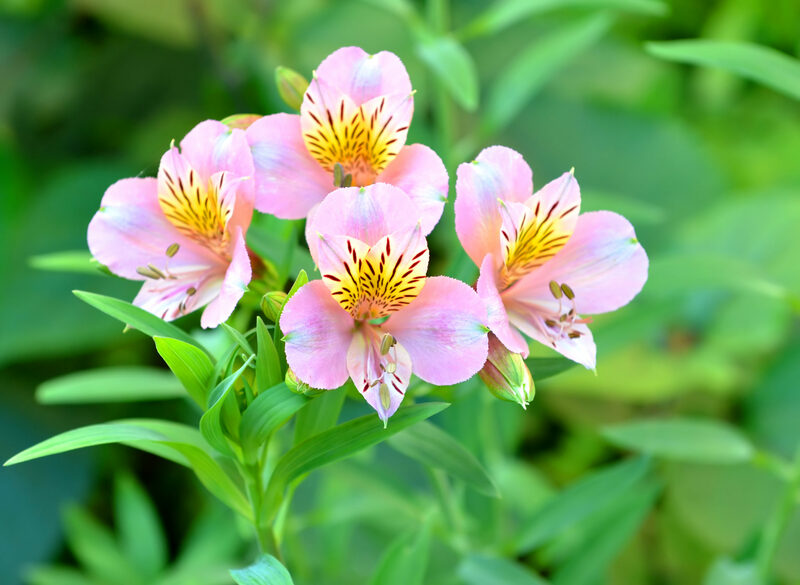 Our October pot choice, Alstroemeria, is more commonly known as Inca or Peruvian Lily. They require very little maintenance, are seldom troubled by pests and are even relatively tolerant of frost which is great news in case we get a late cold snap passing over the country. Remember when potting them up to choose a pot that allows for growth, as they don’t like their roots to be restricted!